On August 5, 1775, the Spanish ship San Carlos, commanded by Juan Manuel de Ayala, entered what would soon be called San Francisco Bay. Unnoticed by such early naval explorers as Sir Francis Drake and Sebastián Vizcaíno, the bay had been sighted by land during a Spanish scouting expedition six years earlier. Spanish authorities, intent on offering proof of Spain's claim to the area, promptly sent nearly two hundred settlers to populate the region. In 1776 both a presidio, or garrison, and a Catholic mission were established. Mission San Francisco de Asís (Mission Dolores) was started by Franciscans, who named both the bay and the mission after the founder of their religious order, St. Francis of Assisi. 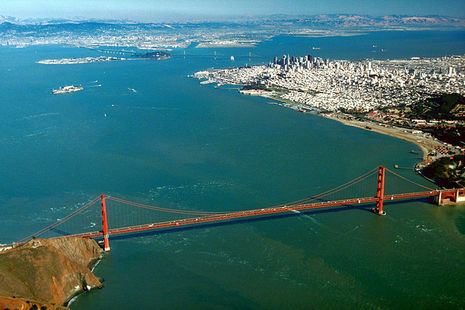 San Francisco Bay is a shallow, productive estuary through which water draining from approximately forty percent of California, flowing in the Sacramento and San Joaquin rivers from the Sierra Nevada mountains, enters the Pacific Ocean. Technically, both rivers flow into Suisun Bay, which flows through the Carquinez Strait to meet with the Napa River at the entrance to San Pablo Bay, which connects at its south end to San Francisco Bay, although the entire group of interconnected bays are often referred to as "San Francisco Bay." San Francisco Bay is located in the U.S. state of California, surrounded by a contiguous region known as the San Francisco Bay Area, dominated by the large cities San Francisco, Oakland and San Jose. I'll pick them off the ground.